CRIMESQUAD went off to a smart gallery in Albemarle Street for a sophisticated launch event for Jane Huxley's new book - SUMMER NIGHT, WINTER MOON . It was a very chic affair and we were delighted to be joined by Dame Beryl Bainbridge who chatted to us about her busy social schedule and her books. 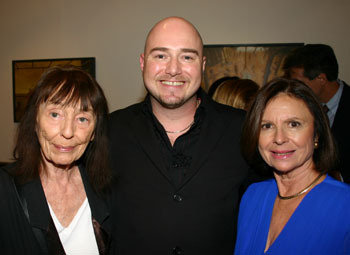 Our picture shows Dame Beryl Bainbridge (left) with our Online Editor, Chris Simmons (centre) and Jane Huxley (right).